While Nokia appears to be on an OEM app updating spree, the Finnish manufacturer has also included their Nokia Music app for Windows Phone, which has now been bumped to version 2.0. This follows both Nokia Maps and Nokia Drive that were both recently updated. 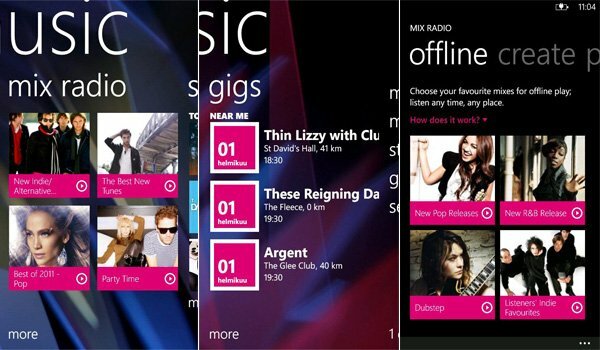 Nokia Music enables Lumia Windows Phone owners to listen to genre mixes, and is the manufacturer's attempt to provide consumers with a solution should Zune not be readily available. The said mixes are available to play offline and can be pinned to the home screen for convenient access. Background playback is supported, but there are some limitations such as the inability to rewind the mix, it's best to think of this app as a personal radio. The mixes are updated every so often with new tracks included and the best part of the service is it's completely free. "Progressive downloading" is taken to the next level with the included functionality for "Music DNA" to scan your PC library and tailor the mixes to your personal taste. If you'd like to have even more control over what content is available to you, you can even select individual artists for the app to take into account. As well as streaming and personalisation options, we have a gig finder, which will search for local gigs near to your location, and access to the Nokia Music Store where the latest hits are on sale. Although it's well suited for emerging markets, Nokia Music is a superb music streaming app that would fulfill the needs of a daily commuter, or someone who enjoys music but doesn't wish to pay for a Zune Pass. As for version 2.0 - we've reached out to Nokia for the update change log, but unfortunately it appears as though only UI and audio improvements are included. Be sure to let us know in the comments should you find anything. 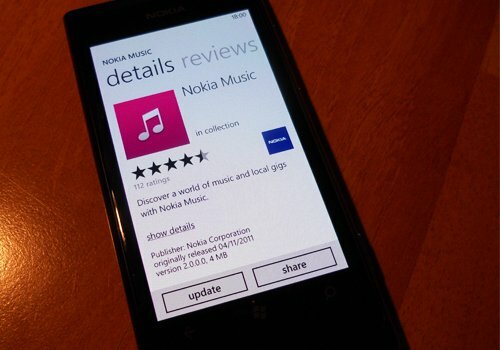 You can download Nokia Music from the Marketplace on your Lumia Windows Phone (not available in the U.S.).